Source: U.S. Energy Information Administration and Drillinginfo, Inc. The Powder River Basin, well known for its abundant coal supply, is experiencing a turnaround in oil production. 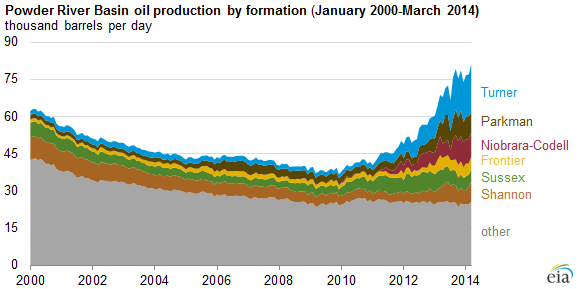 Production has rebounded from a low of 38,000 barrels per day (bbl/d) in 2009 to 78,000 bbl/d during first-quarter 2014. Although U.S. oil production growth is occurring primarily in the Bakken, Eagle Ford, and Permian Basins, the Powder River Basin is among other regions of the country that have also benefitted from the application of horizontal drilling and hydraulic fracturing. 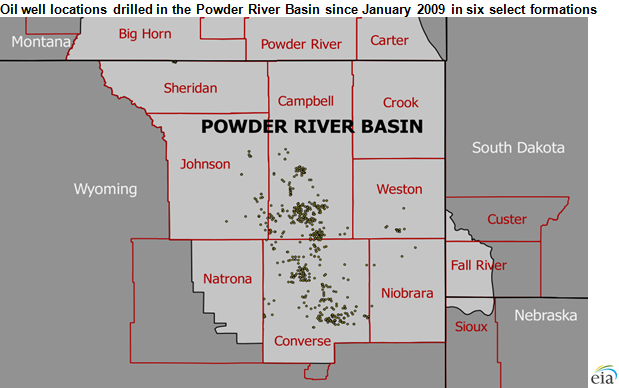 The increase in Powder River Basin oil production is largely attributable to production growth in the Turner, Parkman, and Niobrara-Codell formations, which collectively increased from 4,700 bbl/d in 2009 to 36,300 bbl/d in first-quarter 2014, increasing their share of total Powder River Basin oil production from 12% to 46%. Three other formations—the Shannon, Sussex, and Frontier—also rose from 2009 to 2014, although to a lesser extent, rising from 8,900 bbl/d in 2009 to 17,000 bbl/d in first-quarter 2014, maintaining their share of total Powder River Basin oil production at around 23%. The Powder River Basin encompasses more than 43,000 square miles and is located primarily in northeast Wyoming and southeast Montana, along with small areas of South Dakota and Nebraska. The recent resurgence is occurring predominantly in the Wyoming portion of the basin, which is also the main source of the Basin's historical oil production. Since January 2009, more than 590 oil wells have been drilled and completed in the six select formations within the Powder River Basin, with this activity centered in Wyoming's Converse and Campbell counties. In the past, oil production came from the higher-permeability portions of Wyoming's Turner, Parkman, Shannon, Sussex, and Frontier formations. With the application of horizontal drilling and hydraulic fracturing, larger portions of these formations have become profitable for commercial oil production. In contrast, the Niobrara-Codell formation was not a significant oil producer in the Powder River Basin before 2009, and oil production from this formation is entirely reliant on the application of current petroleum technology.